Many of our Christmas traditions, like Christmas trees and Christmas cards date back to Victorian times. Amongst them is the tradition of the Christmas ghost story. These were often told at house parties or by families, sitting by the glowing embers of their Yule log. Although Yule logs (or at least real Yule logs) have largely vanished, the telling of ghost stories at Christmas has stayed with us down the years. Authors like Charles Dickens and Thomas Hardy have contributed to the genre and for many years, the BBC has broadcast a ghost story at Christmas, either on TV or radio. 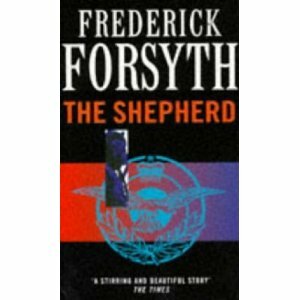 If I’m honest, Frederick Forsyth is probably one of the authors I’d least expect to have written a Christmas ghost story. More usually associated with political thrillers, his earlier books were a staple of my teenage reading. In general, his style tends towards the factually detailed and the heavily plot-driven. He doesn’t go much for psychological complexity or character development. Furthermore, he has some fairly prehistoric, right-wing political views. Nevertheless, the Shepherd is a valiant stab at the Christmas ghost story and is likely to appeal to boys of all ages. An RAF pilot, stationed in North Germany during the 1950s, is due to fly home on Christmas Eve for his annual leave. Flying over a frozen Northern Europe towards Norfolk, he suffers catastrophic electrical failure. Having gone through all possible manoeuvres to avoid crashing into the North Sea, he is resigned to death when, from out of the fog comes a World War II bomber, whose pilot acts as a shepherd, guiding him home. On landing, however, it proves difficult to find a rational explanation for his rescue. Forsyth was himself an RAF pilot in the 1950s and the book oozes technical detail and conveys a real sense of atmosphere. I really felt as if I was in the cockpit with the pilot and shared his sense of isolation and mounting panic as nothing he tries seems to work. He also manages to create the feeling of the fragility of the cockpit compared to the dark and hostile night sky. It’s not great literature, let’s be honest, but it is a nice little tale of the supernatural and a perfect stocking filler. I think it would also be a good book for a teenage boy who is a reluctant reader. Tomorrow we head into the last week before the holidays. In actual fact, I have already finished for the year but have a busy week ahead of me. I also have a great run of books for this second half of my twelve days of Christmas. Tomorrow, it will be Hercule Poirot’s Christmas, a Christie classic, Tuesday will see a touch of non-fiction with Can Reindeer Fly?, Wednesday will bring a little Tolkien gem, the Father Christmas Letters, on Thursday we build up to Christmas Eve with the Big Daddy of Christmas books, A Christmas Carol by Charles Dickens. And for Christmas Eve? Well that’s a surprise. There’s a Hercule Poirot’s Christmas? Great to know! Have you read Capotes Christmas short-story? Highly recommended. I've not read them but shall certainly look out for them now. Just LOVE 'The Shepherd' story. Especially the audio version read by Robert Powell. I can see him doing the audio version very well. Follow our signals right now & make up to 270% a day.